And here we are with part one of a story we’ve been promising for, if not decades, then close to it. I’ve always said that a superhero universe that doesn’t have talking gorillas in it simply isn’t done yet, so it’s good to get such an essential element established here, after almost twenty years. Hope you like reading it as much as we’ve liked making it! And on that note, on with the lettercol. To mix things up, I’ll mention up top this time that every month we pick a letter for this page, using carefully-honed criteria (and when I say “we” and “using carefully-honed criteria,” I mean “me” and “by total whim”). Whoever writes our Letter of the Month gets a copy of the issue in which their letter appears, signed by a member of the creative team (okay, okay, it’s me again). But the other letters we receive aren’t discarded—we run them, too, in the online lettercolumn, so you get even more of my questionably-valuable answers. Well that went sideways quickly didn’t it? I know a big part of ASTRO CITY is the honest aging of everyone in it (except folks like Leo, Samaritan and Infidel, of course), but I didn’t figure it would sting quite this much. Still, there was plenty of sweet on top of the bitter pill that was this installment. Before I read it, I expected Jack was dead and I never thought Quarrel would reconcile with her dad, but now I’m glad both happened. Jack and Quarrel deserve each other, now more than ever. Their relationship never struck me as all that solid before, but it sure does after the last three issues. I’m a Jack fan from way back and I hope he realizes how lucky he is after this misadventure. And the Taggart reunion seemed honest and sensible. I wonder what took more guts, giving up her mask or starting a new relationship with Mack? Both proved she was a hero. I can’t believe you guys don’t get many letters. ASTRO CITY is easily the most multilayered book I read. Between the sophisticated stories and the amazing art, you’d think the mail would just flood in. I guess I’ll have to write more often, that’s all. But Samaritan doesn’t just hope. He acts, to do his best to make those hopes come true. And that’s something we’ll be dealing with in a few issues, as we check in on Samaritan’s dreams again for our 20th anniversary issue. In the meantime, yes, please continue writing in. We’re always eager to hear what our readers think—and while we make no promises to do what you want us to, we do at least listen. I expect the dwindling of letters has to do with readers voicing their thoughts online, or waiting for the book collections, or DC’s overall lack of lettercolumns in general, or some combination of things like that. So it goes, in this cutting-edge world of the future. But we’ll keep doing lettercols as long as we keep getting enough letters to justify them. Okay. What else we got in the online mailbag? That Quarrel story was everything I want out of ASTRO CITY at this point. Absolutely stands alone, but a ton of payoff for those of us who’ve been reading since the original miniseries. We’ve all aged 20 years since this comic started and it is fascinating to see how the characters handle that as well. You constantly hint at having the backstory in mind, please keep giving us the tales we’ve waited 20 years for and keep the twists of our expectations coming too! So: What’s the deal with N-Forcer at last for starters? Wow. It’s such a pleasure to read ASTRO CITY every month, thank you all for your efforts! To see a series being at its peak after more than 20 years of publication is amazing. It was already the case at its beginning but it’s even truer now: ASTRO CITY is telling superhero stories like you can’t find anywhere else. Life stories, emotions, are at the center of it. Never at any point do we feel cheated by splash pages where there shouldn’t be ones, by story arcs too spread out to fill a paperback, or by the interruption of a sily crossover where character are forced to behave like they never had because editors said so. ASTRO CITY in its whole is like a noble demonstration of what you can do with the superhero genre, but also with continuity: using it inside stories to help build emotions and change, not making you forced to write stories you don’t want, to correct “continuity mistakes.” More and more, I feel like you, Kurt and Brent, have build something bigger than yourself. I hope ASTRO CITY will never make it into a movie or TV series. Keep it where it is, as pure as it is. It’s the best demonstration about superhero comics, or comics with heart. We do not have romance comics anymore, yet you can find so much romance in Astro City. ASTRO CITY 21 was exactly the epilogue I wanted to read, without knowing I wanted to! It’s so nice to be surprised by the quality of a product, even after years and years of reading comics. I was amazed by Alex Ross’s cover for issue #21: so poignant. And there is nowhere else where that superhero cover could have found its place. Yeah, this letter is boring, all praise…still I wanted you to know that in my little corner of France, you bring me joy one day per month. That’s not bad as a power, is it? 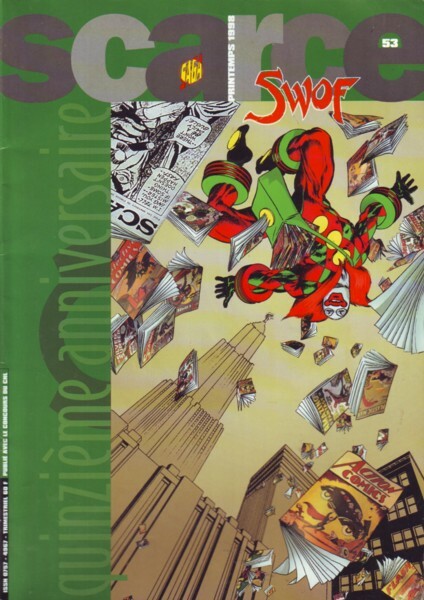 On a side note, I was wondering if Brent and Alex remembered this (see attached): that was an issue of SCARCE, the French magazine on US comics I’m now the editor of, where we interviewed both of them and wrote about the series…back in 1998. I hadn’t started working with the magazine yet, so, in case you never received a free copy (shaaaame! ), I will be happy to send one to every member of the team. I know I’ve got copies of that issue of SCARCE somewhere in the basement, Xavier, so I’m pretty sure we all got them. I couldn’t read the interview (my junior high school French classes have long since failed me), but it was a treat to see it, at least. Thanks for the very kind words. I can’t promise we’ll never do a TV show or movie (and we’ve got lots of readers who’d urge us to disregard your wishes on that), but whatever happens, the comic will still be the comic, on its own terms. Hopefully, whatever might come, that’ll be enough. When I got married, just over 10 years, ago I told my wife to put a bullet in my head when I’m 50 if I can no longer play basketball. I was kind of joking. I have never been the best but it didn’t matter. I just love playing the game. For the past decade I’ve played at least once a week either with friends, co-workers, or down at the local park. Sure I was a lot more sore after games than I used to be but it wasn’t anything unbearable. I just had to ice up my joints more than I used to. A month or so ago, at age 39, I leaped up to get a rebound, something I’ve probably done thousands of times. When I landed I felt my back just go. This wasn’t just an ache. I couldn’t run and I could barely walk. I went home, iced it, and figured with rest I would fine. As of now that was the last time I played. I am walking okay, but every time I run or jump my back won’t let me for long. This is the moment when the story of Quarrel and Crackerjack went from an enjoyable tale to one of deep personal meaning. To be quite honest right now I’m probably leaning toward Jack a bit, as I’ve seen doctors, started yoga, and talked to a physical therapist seeing what can be done. The conclusion showed me however that it is possible to find another outlet and another challenge if needed. I have a son who is about the age I was when my dad first gave me a basketball. Maybe that’s where I’ll be. And I thank you for that. At least I know I’ll probably tell my wife to forget about the bullet. Sounds like a good plan, sir. And you’re more than welcome. Have you considered taking up the drums? Maybe I’m one of the few, but when the Black Lab was first mentioned, it actually reminded me of the Black Lodge from “Twin Peaks”…or something like a science version of the Brujeria from of Alan Moore’s early SWAMP THING. In my mind, it originated as an ancient society, based on some sort of Chthonic ur-alchemy and eventually evolving into a cabal dedicated to science with a dark, religious twist. It’s an awesome idea. But you know what’s the weirdest thing? I never connected the name “Black Lab” with, you know, black labs, until I saw the logo on the 1st page of ASTRO CITY 21. I’m very proud of the Black Lab. I like names like that. Maybe too much. Maybe way too much. But no one can stop me. First of all, Kurt, let me send wishes for good health. I see that you haven’t posted here since your March 10th explanation that a kidney stone was delaying the usual letter column. I hope that isn’t still troubling you, or that if it is, it will be gone soon. So that just leaves me with one other thing to write: any chance we could get a story featuring the Crossbreed? I’ve been wanting to know more about them ever since their appearance in CONFESSION, so many years ago. I think religion and faith are subjects woefully underrepresented in comics. I understand why most writers (and publishers!) shy away, but I’m convinced you’re the guy who could tell a thoughtful and compelling story about faith-based superheroes. Anyway, thanks again for all the reading pleasure, and best wishes for continued or restored good health. Alex and I were just talking the other day about how I want to get to do another Crossbreed story. So it’s on the list, though I’m not 100% sure what it’d be yet. I’d just like to explore them some more. At one point or another, I heard that you or somebody else talked about ASTRO CITY being optioned for a movie. Though it seems like that would be a long time in the future, I just don’t know if a movie would be the right way. I know that the comic is fully capable of working in a movie format, it being easily able to be cut down to a one to two hour time limit. But I don’t feel as if that’d be the right way, since in my opinion the characters need more than two hours to get to know them. I don’t know, I’d rather it be a TV series than a movie. I’d equate a possible film of ASTRO CITY to a film adaptation of the WILD CARDS anthology; both have characters that can be portrayed better in a long-running series than a movie. In all, do you think ASTRO CITY makes a better movie or TV show? ASTRO CITY’s been optioned multiple times over the years, sometimes as a feature film, sometimes as a TV series. And at least one producer’s gotten excited about the idea of using it as the basis for a whole slate of films, building on each other like the Marvel movies have done. Me, I can see strengths either way. I’ve come up with movie treatments that I think would work very well, and take advantage of bigger FX budgets than TV has, but I can see a TV series playing well, too, if the material is approached right. I don’t think it’s a matter of choosing one or the other blindly, but of who would be doing it, what their approach would be, and how they could realize the vision of the series. …why choose? Start out with a TV series, then make some movies. Start out with a movie or two, then spin off a series. Dream big. Why not? This letter is just questions, but I’m also writing it so that you don’t stop doing the letter column because the ending of the April one made it seem as if you might stop the column. 1: Even though it seems that you stopped putting analogues in the comic, is there an analogue to Plastic Man? 2: Would you ever do an issue exploring the main superheroes of the major countries, and going more in depth? 3: If you ever passed on, would Alex and Brent finish the last issues with leftover notes or would the series just end? 4: Finally, is Ben-Triloquism a real character for the comic? Keep sending in mail, and we’ll keep filling the column! 1. We never started putting analogues in the comic, at least not in the sense that I think you mean it. But if you’re asking, are there characters who stretch and change their shape, yeah, I’m pretty sure there’ve been some, but would that be an “analogue” to Plastic Man? Or Mr. Fantastic, or the Elongated Man, or anyone else with stretching powers? If you mean a clownish character who annoys the crap out of the heroes around him, we had Crackerjack. If you mean a criminal who became a hero once they got powers, then there’s probably someone like that in the world. There are a lot of different ways to resemble Plastic Man other than just the powers. 2. Depends on if I had a story to tell that I thought was worth telling. I wouldn’t do it simply to establish those heroes, or to catalogue them. There’s have to be a human story that would play out well through a scenario like that. And I have no idea whether I’ll come up with something like that or not. 3. Hopefully, by the time I pass on, we’ll be done with the series. I don’t have any notes prepared in the case of my sudden death, so what would happen after I died would be up to my wife Ann (presuming she’s still around when I’m gone) along with Alex, Brent, our publishers, and so on. But I’ll let them figure it out, if I’m dead. 4. No, I just mentioned him online as a gag, because it’s a funny name. Unless I come up with a great idea for a story. If I do, who would dare stop me? I’ve been reading comics since 1953. My mother was a cashier at the Vogue theater, in the Bronx, NY, and many Saturday’s they would give a comic book as a premium to all the kids who came for the matinee show. And after school, I would walk over to the theater to wait for my mother to finish her shift and walk me home. I had free access to the cartons of comics stored near the projection booth. Movies and comics in one place. It was a kid’s dream of paradise. Maybe an adult’s dream, too. I’ve been collecting comics since 1970, shortly after I graduated from college, when I bought Conan #1 off the stands. I told you all that to tell you this. Sticks is the best gorilla comic EVER! I can’t wait for the subsequent issue(s?) to reach my local comicbook shop, but I guess I’ll have to. Thanks so much for what you’ve created for the last 20 years and here’s my best wishes for your good health. Thanks for taking the time to answer my letter.